D.B.S Jeyaraj of the Daily Mirror has mentioned in his article saying that P.K Balachandran had mentioned in his article of the Indian Express, the affluent USA and regional giant India, both are not satisfied of the movement of C.V. Wigneswaran. D.B.S Jeyaraj once who was an ardent supporter of the Tamils’ liberation struggle as well as a diaspora Tamil of Canada fights with his writings against Wigneswaran. As D.B.S further writing highlights that C.V has been a stumbling block to the unity of the TNA. His recent view seems to be that if C.V is evicted, the unity of the TNA will become more healthy and firmly. Secession has been traditional curse of culture of the Tamil society. Tamil community has been a community of supreme culture which eradicates the people who have entirely different ideology or being labeled them as traitors of the Tamil community. As there has been a ground of freedom of writing, writing the baseless writings, maintaining conservative ideology on the Tamil community and applying supreme power, are not the appropriate things for those who have consciousness. C.V. is not beyond the criticism on different ideology. It cannot be said he has been away from Tamil political ideology. It can’t be said further he is not a person of skepticism of the religious honesty and truth. It is contrary to point out him as a terrorist than the chauvinists who wipe out the existence of Tamils so far and the present hierarchy of the Tamils. It’s true that C.V has been a political emblem which is contrary to the position of the Tamil hierarchy with the chauvinists. It can’t be forgotten that though many had opposed at the outset, while he took oath as Chief Minister in front of fascist Mahinda Rajapaksa, the former president and had several conversation with him, he was scolded on the ground of his children’ wives are Sinhalese and he too resides in Colombo so that he had subjected to Sinhala chauvinism. At present forwarding criticism on democratic atmosphere on Ranil and Maithiri government, he is being criticized that he has been guided by the diaspora Tamils as well as Tamil agitators of the homeland. It is true that there has been a democratic vacuum emerged and some steps were taken for rehabilitation, beyond this, this present government has done anything to Tamils . It’s absolutely right that the present government could not move to the minimum steps such as releasement of captives, retrenchment of military and handling over the encroached lands by the military. It may be that C.V has been a perpetrator to Samantha Power and USA as well as journalists and the India. If CV acts as dummy, he would be thrown out into dust bin with the list of dummy leaders. Though there has been no emergency to either safeguard C.V nor to give support, no one need to say that he has been an obstacle to the present government and the Sinhala community. Its totally ignorant that due to the agitation the present government has been hesitant to endow the political rights to the Tamil and “wicki” has been an obstacle to Sampanthan to negotiate with present govt. It may be a basic human right to criticize the political ideology of C.V which may not be constructive. So no one has right to command to subject to the chauvinists nor the USA nor India. 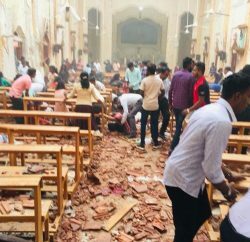 It’s not a secret matter when the Srilankan government the attacked on Tamils homelands in the name of humanitarian operation the USA and India rendered their fullest support. 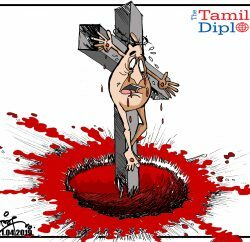 It can’t be said that when chauvinist countries act against Tamils, they can be silent without raising voice as activist. As opposing the chauvinists, the Tamils would oppose any hidden agenda of the chauvinist countries who prevail upon the Tamils those who dislike them can called as Tamil militancy. How it would be appropriate to Tamils to evict Wignesswaran from TNA. To the Tamils it is incongruous to evict C.V, but it may be appropriate to the chauvinists and colonialist forces. The conflict between Sampanthan and C.V is based on policy. The conflict should be resolved on democratic culture of the Tamils politics. It’s not appropriate that those who have conflict ideologies should submit themselves to chauvinists’ forces. This trend should not prolong. C.V has been promoted to this position respectively as judge, chief justice and chief minister under democratic process. He doesn’t need any position of hierarchy nor need of exploring money. So his conflict with TNA has not rooted on personal policy. So those who wise to show their concern on the unity of the TNA can choose the healthy step to solve conflict, not evicting of C.V from TNA, but forwarding genuine and real steps towards finding solution. While there has been turbulence in the leadership of the TNA, there has been a deplorable situation in the leadership of the parties of the Indian Tamils, another suppressed national race in Sri Lanka. So far the salary problem of the workers of the plantations sectors’ solution was not found. Though the ultimatum for the salary increment according to the co-operate agreement which is to be increased biennially has not been met even after lapse of 9 months. This agreement has already lapsed with the month of March. Though the Sri Lankan Workers Congress, Sri Lankan Plantation Workers Union and Plantation Labour Union Fellowship have engaged in the arbitration for several times for solution. But Solution was not found. In the matter of salary increment there is a need of government involvement, thus had prevailed the Forward Tamils Alliance. Negotiation was held with the participation of the plantation minister, John Senawaradna. He hopes to increase the day payment by Rs 780, but Sri Lankan Workers Congress already proposed Rs 1000 per day. Though this kind of demand was deemed a slogan for election by the Forward Tamils Alliance the increment per day Rs 1000 was considered a prevalent demand. In the meeting which was held day before yesterday with the managers of plantation companies association who represented the plantation companies assured not to increase any cents. Unless they consent for increment, the state may have to take over the plantation sector thus warned John Senawaratna. Though this can’t be convinced as a genuine warning, the state must do the same. The companies have already violated the regulations which are bound up them by the state. The companies have already deteriorated the plantation economy and the situation has made worse the people life. There has been emergent of peaceless situation due to fragmentation of relationship among laborers. In this atmosphere there are possibilities for taking over the estates, having been terminated the agreement on lease. Besides, the estate administration can be organized with three polar participation of private sector, laborers and the state. At the moment of complete fiasco of negotiation, Suresh Vadivel the parliamentarian of Badulla district has warned to put himself in fire giving ultimatum till yesterday evening, unless salary increment is assured. To those who had made ridicule himself, he warned further as he dies he would put in fire others who make harm to the plantation Tamils. Its unknown that whether he would die or not, the plantation workers salary will not be increased is understandable. While Vijitha Herath raising question at the parliament, Thikamparam the minister responded that it was not me but Arumugam Thondaman who had asked the increment of salary Rs 1000 for the sake of election. Thikamparam, himself managed situation without giving any assurance about increment. His position was whether the increment was possible or not it was enough that SWC should be defeated. The response which was uttered by the minister Thikamparam was a responsible one and he assured that an inquiry would be carried out pertaining the corruption held at the Thondaman Vocational Training Center. It must be concerned that the alteration of the name of that training center due to whether the need of time or expression of hatredness. History includes many contradicted recordings. Though there is criticism about Thondamana he too had created a history. So whether name eradication or naming others for institution should arise out of the need of the people. Mano Ganeshan mentioned in the parliament Indian Tamils did not like to name in birth certificates as the same. His Forward Tamil Alliance too second the minister’s demand. They have no consent to name them as ‘malaiyagathamizhar’ instead of Indian Tamils. Those who do not have backbone to response the people that the prime minister saying to the Forward Tamils Alliance that he doesn’t have money to build up the houses for them, falsely make propaganda that houses would be built up for each one. No need for long time in order to understand that the alternative politics can’t be build up on the basis of antagonism against Thonda and S.W.C. it is better that the politician may understand that politics exists in and out of the present political set up. Though there is an existence of essential of politics of conciliation, the politicians should not forget that there is an existence of alternative politics. This conflict is rooted due to rejection of TNA’s other parties to become part of Thamil Arasu Kadchi(Federal Party). In 1969 , 17 of us did a fast and vigil in front of Veerasingam Hall in Jaffna, asking the Federal party and Tamil Congress to unite for the sake of Tamil speaking community has been loosing their rights one by one to the Singala majority. To resist this trend that unity was needed at that time. We the youths felt the importance of the unity. During that sitting, Kytes MP Pandithar K.P. Ratnam visited us and asked us that, you are asking us to unite, but on what policy?. But Thanthai Selva and Thalaivar G.G. Ponnampalam united the Tamils speaking people in 1972 and formed the TULF. They made it happen, because they behaved like responsible leaders and understood the urgent need for that unity at that time. Mr. Senathirajah and Mr. Anandasangary has a historical responsibility to unite the Tamil speaking people under the same TULF. They can work out an amicable solution using a democratic process to elect a management committee to take forward this unity. This is an important time to show our unity to UN and to the international community that we are united and expecting a political solution based on International Law and ‘The Universal Human Rights principles’ accepted in 1948. Mr. Senathirajah, the President of Federal Party has nothing to loose by talking to Mr. Anandasangary is also an elder politician been part of them during the LTTE period. Day by day the conflicts are growing. To divert this trend the only solution is that they all have to come together to respect Thanthai Selva and Thalaivar G.G. Ponnampalam to unite under this registered party TULF. We can’t sacrifice the our identities and our fundamental rights for this leaders cheap pride and selfishness. Definitely, Mavvai MP and Mr. Anandasangaree must meet and gather. TNA should re- add TULF into TNA.